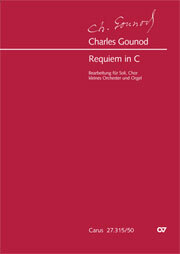 Charles Gounod composed this Requiem under the impact of the death of his four-year-old grandson, Maurice. According to information handed down, while finishing the details of this work he was overtaken by death. It was published posthumously in various constellations by his pupil, Henri Busser, but the only complete version from the pen of Gounod is the version for large orchestra, which is published here for the first time in a critical edition. 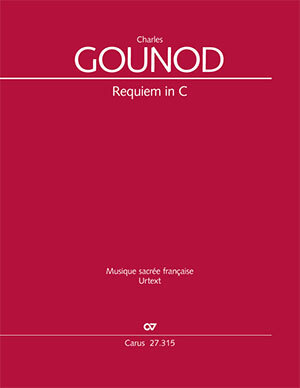 Gounod’s Requiem, unlike many contemporary settings of the Mass of the Dead, is not characterized by darkness and terror. Rather, with all of its trepidation – expressed through a marked chromaticism – an atmosphere of hopeful expectation, of trust in the grace and equity of the divine judge predominates. This confidence finds its expression in the choice of the fundamental key of C major, which is rather unusual for a requiem. 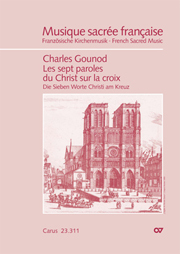 The work was given an impressive performance on the occasion of the first anniversary of Gounod’s death in the Parisian church of Sainte-Madeleine under the direction of Gabriel Fauré and it was highly acclaimed by the contemporary press.